Thursday is Vince Carter's 40th birthday, but we're the ones who received a gift. To honor the 19-year veteran, the NBA did us all a favor by releasing 40 of Carter's previously unseen dunks. Now, most of the time when things are tabbed as "unseen" they're actually things real fans have seen a million times. While this footage isn't technically unseen (there are players with him and people in the stands), these are legit underground videos from practice, USA Basketball competition, charity events, etc. It's time to turn back the clock with some vintage Vince. If you watched the NBA in the late 90s and early 2000s, this has to make you nostalgic. Carter is arguably the best dunker of all time, and his performance at the 2000 dunk contest is one of the signature moments in NBA history. Shaq pretty much summed up all of our feelings after watching Carter break out dunks we never thought were humanly possible. Perhaps even more impressive than Carter's insane dunks was his ability to successfully transition into the second stage of his career. So many times we see players who rely on athleticism fall off the map once they get older, but Carter -- currently with the Grizzlies, his sixth NBA team -- improved his three-point shot, got better on the defensive end and figured out how to become a role player. Thanks to his extended career, he now ranks 24th all-time in scoring, fifth all-time in three-pointers made, and is pretty much a lock for the Hall of Fame. Not many people get to celebrate their 40th birthday as an NBA player, so Carter's clearly doing something right. MEMPHIS, Tenn. – Vinsanity comes in vintage flashes these days, as the former hurdler of 7-foot Frenchman and author of unimaginable slam dunks descends from his half-man, half-amazing heights to his half-man, half-aging twilight. On Wednesday night, the eve of his 40th birthday, Vince Carter punched in 30 minutes on the clock for a Memphis Grizzlies win over his original team, the Toronto Raptors, but his work had only begun. As fans exited FedEx Forum, perhaps still marveling at the 360-degree layup the old guy pulled off earlier that night, Carter was resting his back on a weightlifting bench, preparing to press 225 pounds while Grizzlies strength and conditioning coach Chattin Hill held a double-wide paddle on his chest to mark the press. For 20 minutes, Carter lifted, worked on a speed bag, did core exercises with a medicine ball and used other weight-lifting machines while the music of rapper T.I. provided the background noise. The Grizzlies are all too familiar with the grueling postgame routine that Carter has maintained since joining the team in the summer of 2014, so there was no shock or awe that he was putting his body through such a grind – or that the NBA’s oldest player was the only member of the squad delaying the ice and shower for a few reps. Carter didn’t become one of 17 players to reach 19 seasons in NBA history strictly because he just wanted to hang around or coaches wanted to honor his name. This kind of longevity required a passion and love for the game that was somehow questioned during his early days as a rim-punishing, aerial gymnast. To outlast so many of his peers and rivals from that initial post-Michael Jordan era, Carter also needed to dedicate himself to do whatever it took to not only be on a roster but remain a valuable contributor on a playoff contender. That meant swallowing his pride to make the uneasy mental transition from superstar to sixth man, sacrificing a few late-night good times and committing to a game-day program that involves him arriving three hours before tip-off to put up shots, bathe in an ice tub, and undergo treatment and taping – all to chase around players, some of whom are now half his age. Kobe Bryant, a longtime foil going back to Carter’s AAU days, stepped aside last season after becoming the first perimeter player to reach 20 seasons. Allen Iverson, with whom Carter staged his greatest one-on-one battle during a 2001 second-round series, was inducted in 2016 into the Naismith Memorial Basketball Hall of Fame. And Tracy McGrady, his cousin and former teammate with the haunting what-if of a career that was ringless, just got the call that he’ll be on the Hall of Fame ballot for the first time this year. Those were three of the players with whom Carter spent the early part of his career entangled. There were numerous others, but none tested him more. And they were also the names often used by critics who questioned Carter’s drive and expected him to leave the game once his athletic gifts began to wane. Carter never forgot what was said about him when he was establishing himself as one of the game’s most popular players. He also didn’t waste his time trying to defend how he felt about basketball: His answer comes every time he slides on that uniform and dons a headband for the umpteenth time. Carter hears all the time, from peers, coaches, executives and fans, how he’ll be headed to the Hall of Fame after he hangs up his size 16 sneakers. He’s only 81 points from passing Iverson for 23rd on the all-time scoring list, four 3-pointers shy of becoming the fifth member of the exclusive 2,000-made club, and about to have the fifth-highest scoring average by any player in his age-40 season. His uncertainty over what happens once his career is over isn’t just a motivating factor for playing but for also doing all of the ancillary activities required to stay healthy enough to compete. He needs no reminder that he hasn’t tasted the champagne of a championship shower, nor has he even made it to an NBA Finals. But chasing jewelry has never been his thing, and it won’t be all he takes into consideration when he becomes a free agent this summer. Carter still enjoys the camaraderie of being around his teammates, of absorbing old-man jokes, of joking with 20-year-old Deyonta Davis that he could be his father, of having the guys over to his Central Florida home for Christmas and shootaround – yes, his house has a gym large enough to host a practice. He’s not ready to start missing all of that, even as he shows up for every season saying farewell to another familiar face. 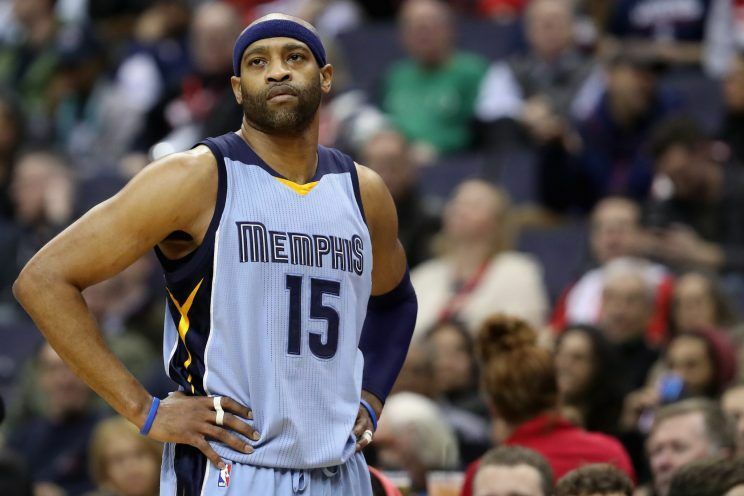 Vince Carter is a gift we don’t deserve, a star who burned brightly and didn’t burn out. Unlike, say, Tracy McGrady (who is two-and-a-half years younger! ), Carter has managed to remain a useful NBA player more than a decade past his prime. Carter turns 40 years old today, and he celebrated with the above 360-degree reverse layup last night’s against the Raptors. Carter, the reigning NBA Teammate of the Year award winner, played 30 minutes off the bench in Memphis’s 101-99 win over the Raptors. And he’s on pace to make his 11th career postseason, a wonder considering some of the crappy teams he was on back when he was asked to be their best player. Never leave, Vince. 0 Response to "The NBA released 40 unseen Vince Carter dunks in honor of his 40th birthday"